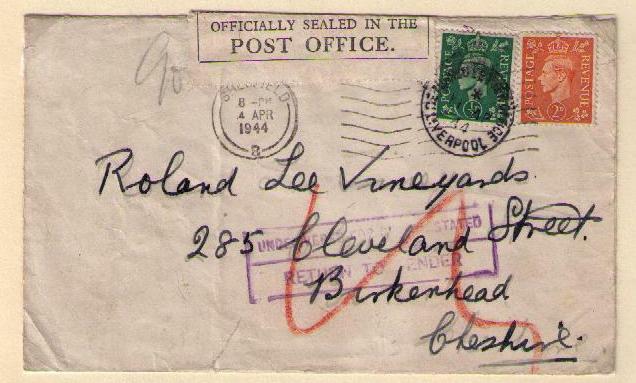 Inland postal rates increased on May 1, 1940 and remained stable into the 1950s. 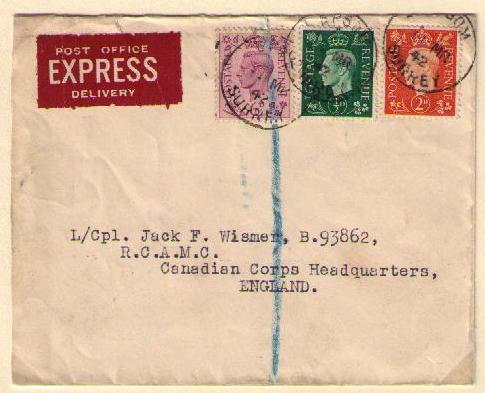 This article however only deals with war-time period mail starting from May 1, 1940. 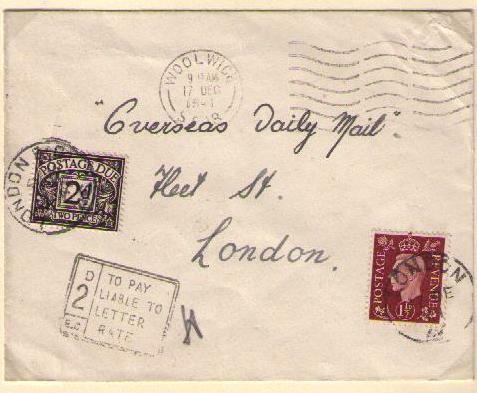 A future article will cover the rates and fees applicable during the post-war reign of George VI. 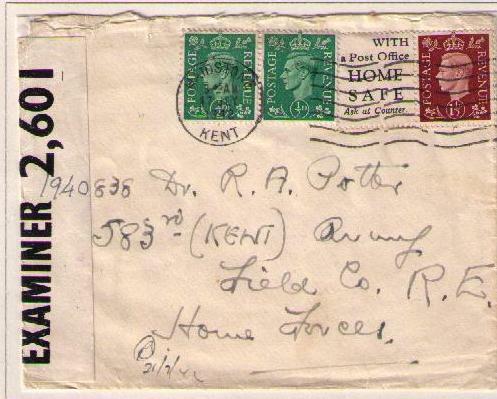 On May 1, 1940, inland letter, post card, and printed papers rates increased. Registration and Express Delivery fees were unchanged. The 1/2d. to 3d. 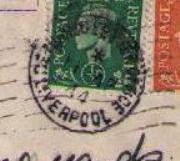 denominations were printed in paler colours beginning in mid-1941. A future article will discuss this topic. 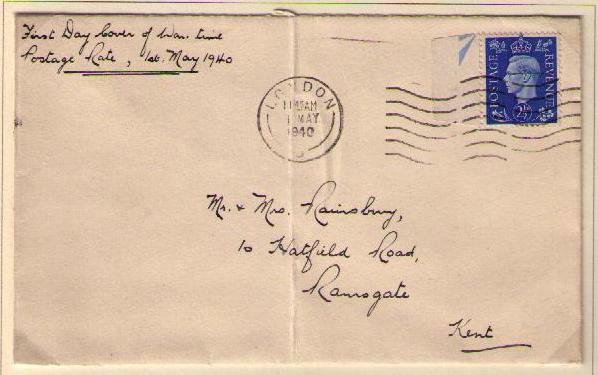 The letter rate was increased from 1 1/2d. 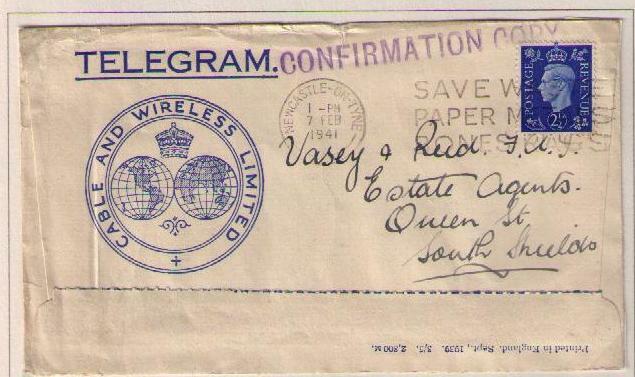 to 2 1/2 d. on May 1, 1940. 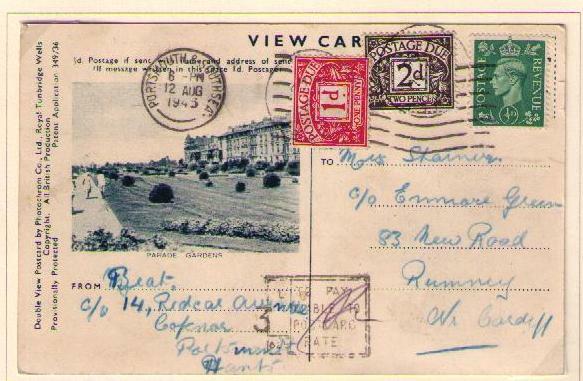 "First Day of War-time Postage Rate"
The ordinary inland rates of postage and general regulations applied to mail addressed to persons serving with his Majesty's forces at home. 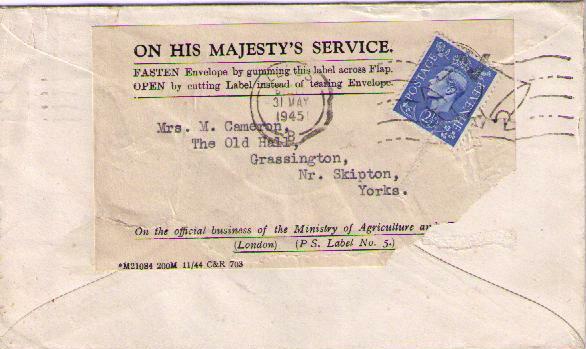 Merchant Navy Comforts Service "Paper Saver"
An addresses sticker was affixed to the back of the envelope. 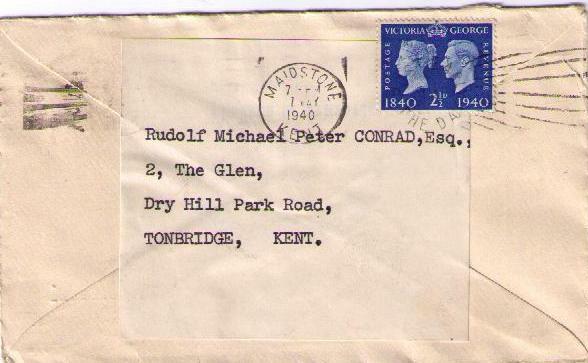 The re-used envelope was mailed to Tonbridge on May 7, 1940. 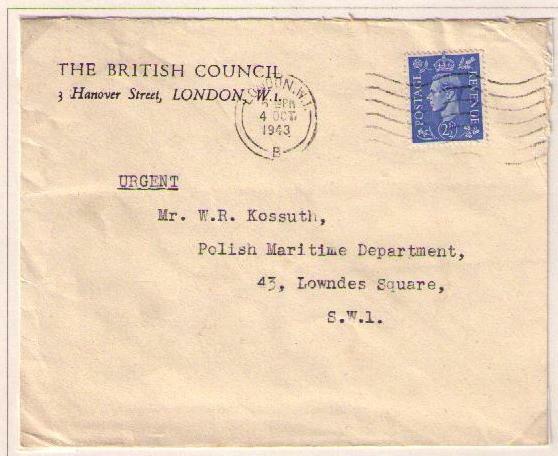 The British Council was founded as an organ of internal propaganda. 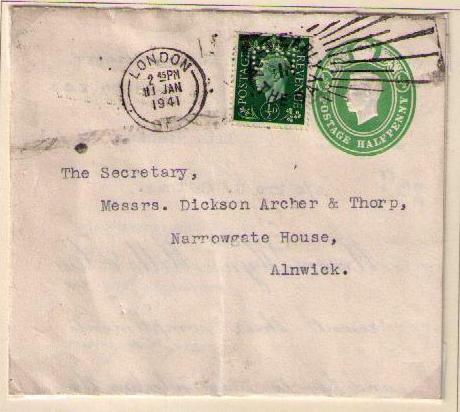 During the late 1920s an influential group of civil servants became convinced that "British" values of parliamentary democracy could be subsumed by the rising tide of fascism. 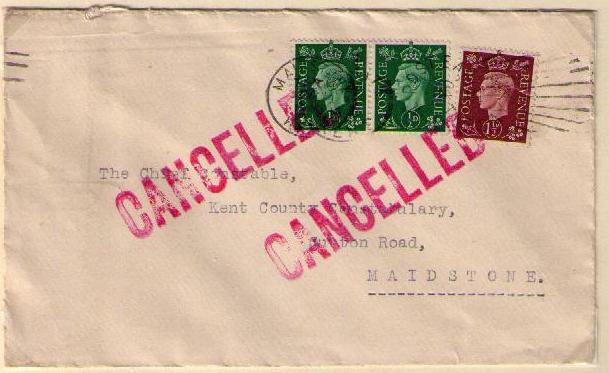 Their response was the British Committee for Relations with Other Countries (1934), which became the British Council (1935). Particular Council initiatives included the teaching of English, but political messages always came with language lessons. 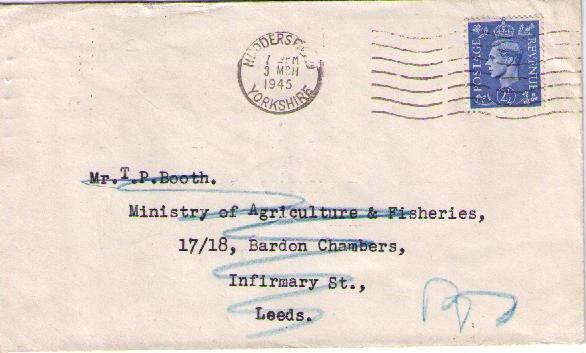 R. Harkness & Company were rose breeders from Hitchen, Hertfordshire. 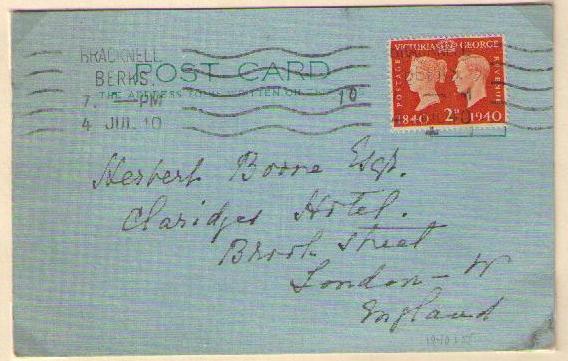 The nursery was founded by brothers John and Robert Harnkness in 1879. 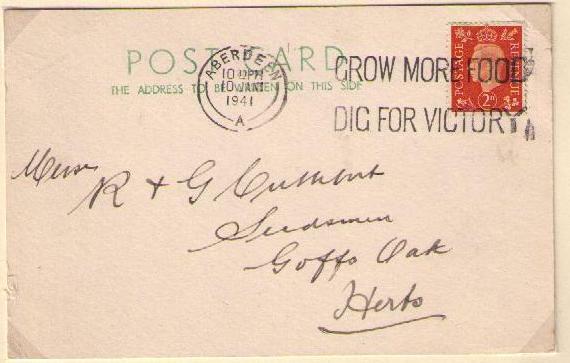 Today (2010), the Harkness nursery is in the hands of the fourth generation, Philip and Robert Harkness. 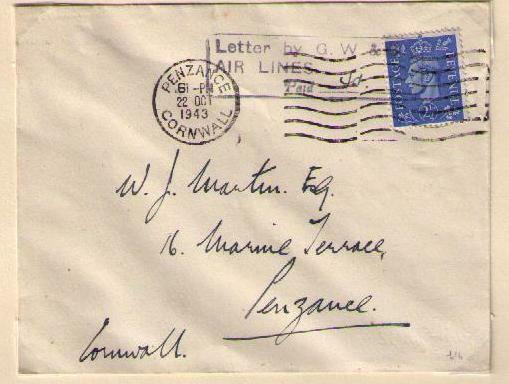 The 1944 letter head lists some awards won by R. Harkness & Co.: The Championship and Coronation Trophies H.M. King George V H.M. Queen Mary Cups Edward Mayley And N.R.S. Gold Medals etc. The awards continue to this day with the Chelsea Flower Show Gold Medal 2010 for Harkness Roses. 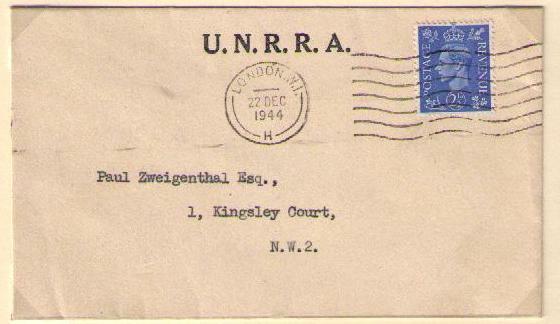 The UNRRA was founded in 1943 to give economic and social aid to countries that were under German occupation during World War II. 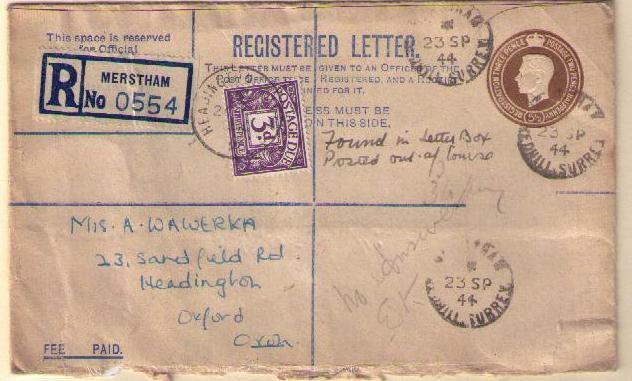 UNRRA, a division of the United Nations, was actually founded before the establishment of the United Nations, by an agreement signed by the delegates of 44 countries in Washington, on November 9, 1943. 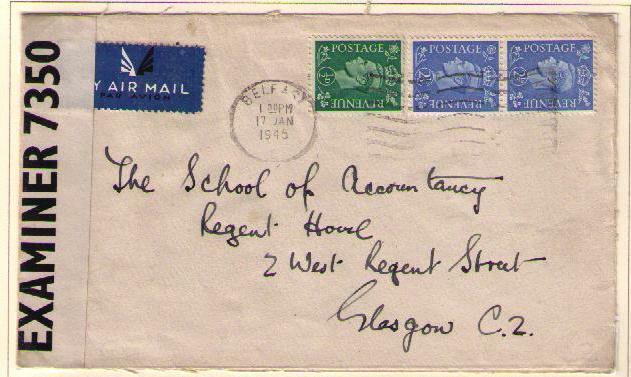 Undeliverable letters without return addresses were processed at return letter offices. 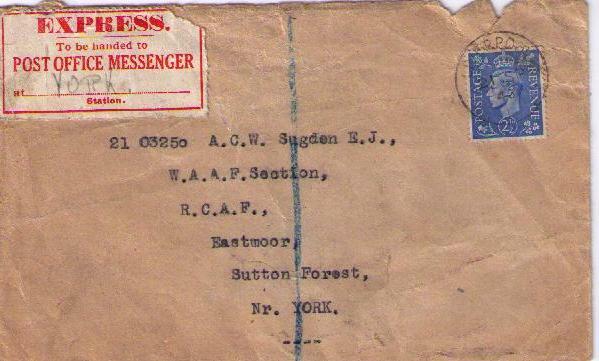 The letters were opened to determine the sender's address and sealed with a tape. Shortpaid 1 d. and taxed 2 d.
Shortpaid 1d. and charged 2d. 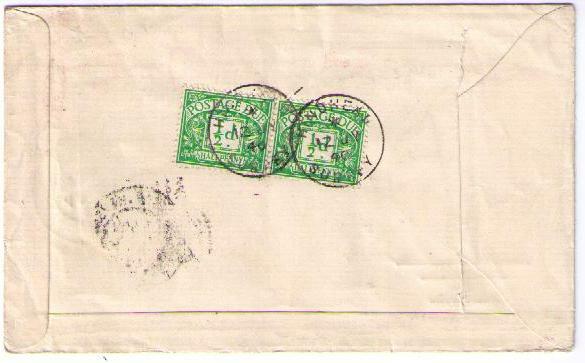 Shortpaid 1 1/2d. 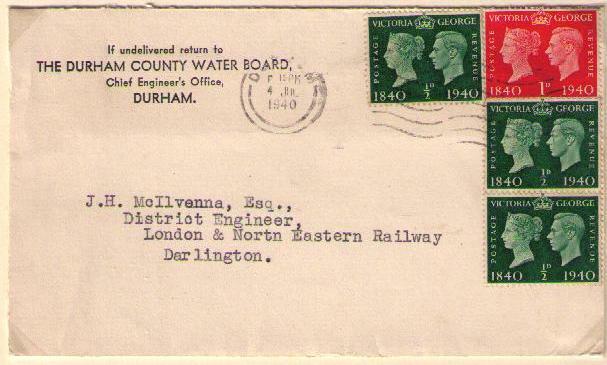 and taxed 3 d.
Under agreement with the Post Office several railway companies accepted and conveyed letters. 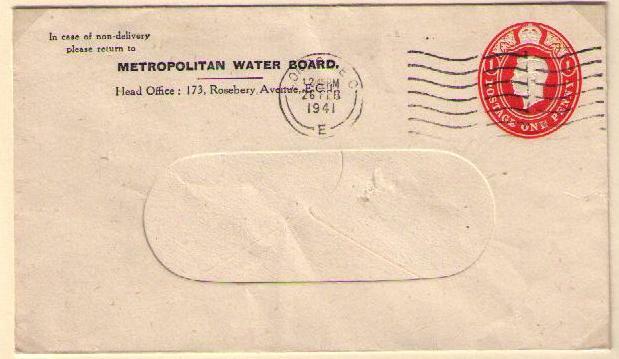 Postage at the appropriate inland rate had to be prepaid. 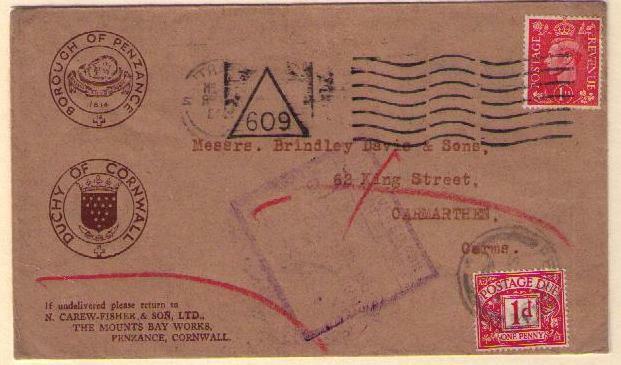 Railway letters could be specifically delivered by Post Office Messenger from the station of address. 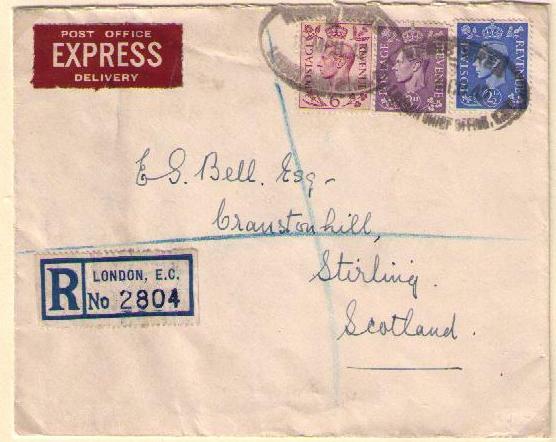 The Liverpool/Glasgow - Belfast air mail service was introduced on September 1, 1941. 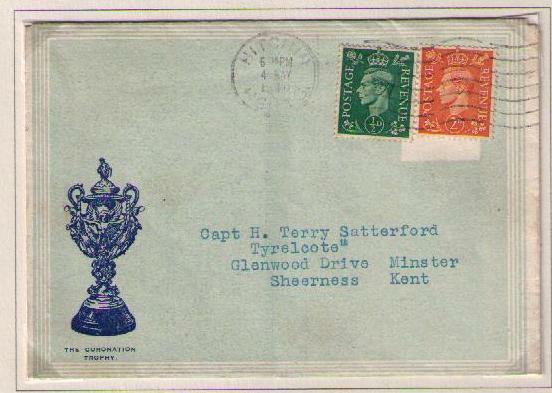 The fee was 3 d. per 8 ounces in addition to the regular postage. 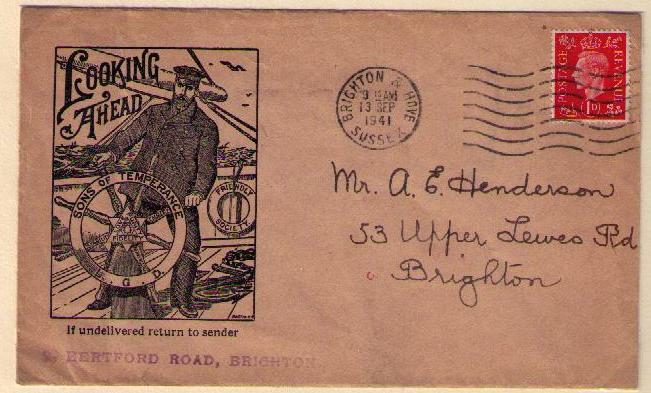 This was the only inland air mail service provided by the Post Office which had an additional charge. G.W. 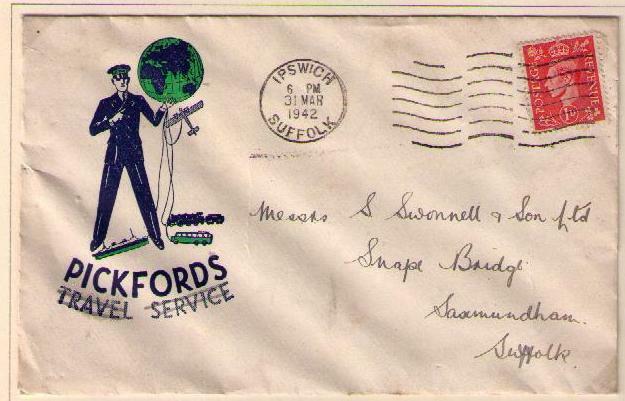 & S. Air Lines was formed in December 1938 by Railway Air Services to fly its southern and midland routes and to link the provinces' towns. 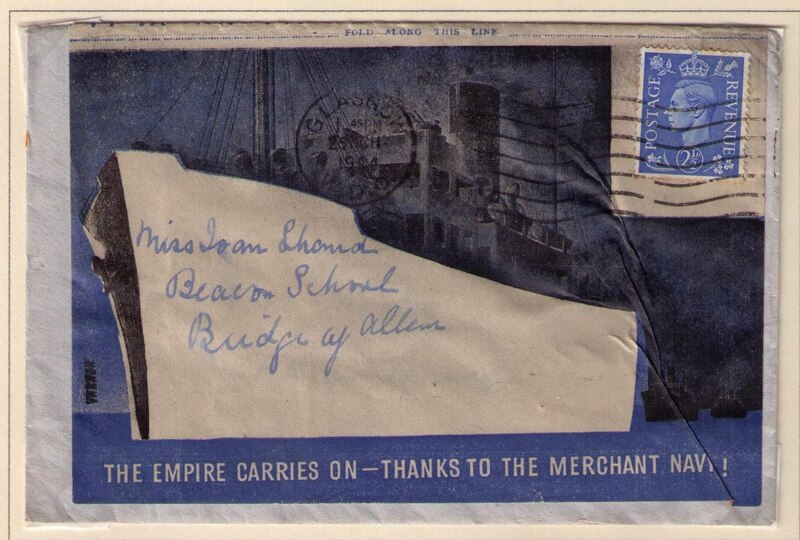 All of the company's services services were stopped during the war except the 29 mile flight between Land's End and the Isles of Scilly. 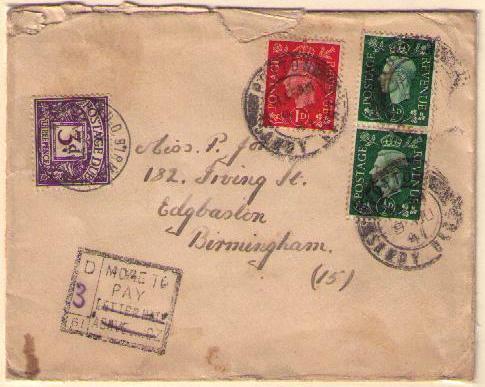 Prepaid l etters carried by G.W. 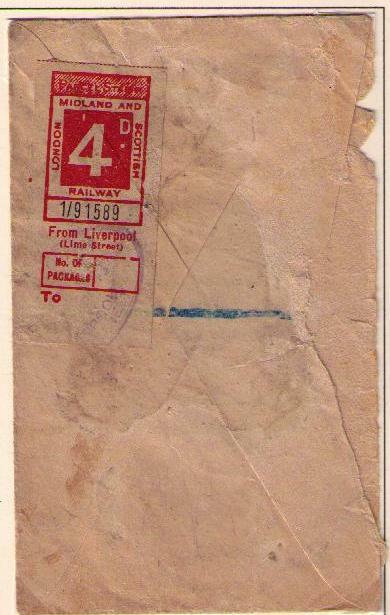 & S. Air Lines were charged a 4 d. fee. 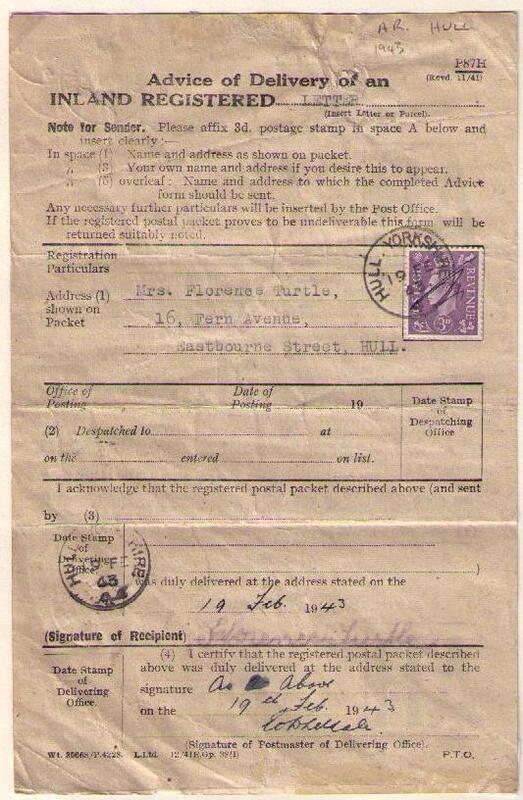 The fee was payable in cash before transmission. 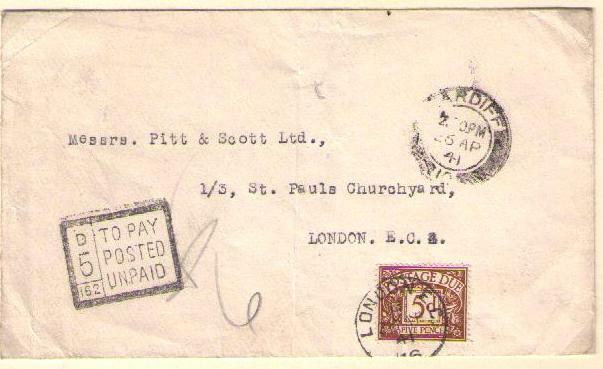 Payment was noted by a handstamp. Shortpaid 1 d. and charged 2 d.
Shortpaid 1 1/2d. and taxed 3d. 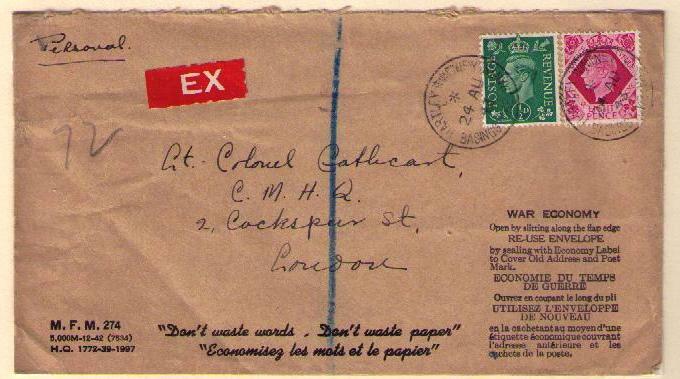 Paper shortages during the war resulted in the manufacture of envelopes from non-traditional paper sources. 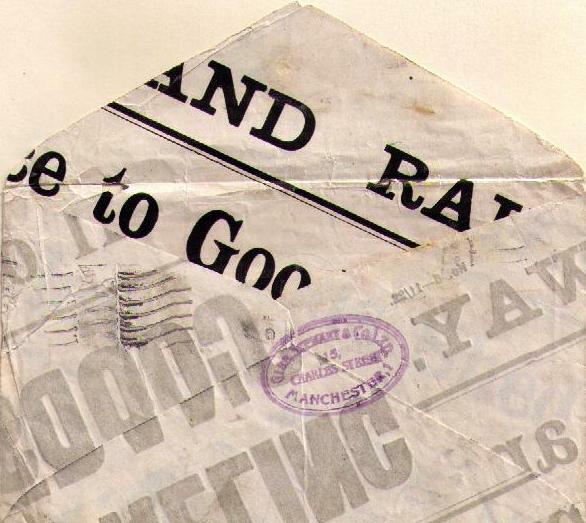 The envelope below was made from a poster. A further economy in this case was the re-use of the envelope. 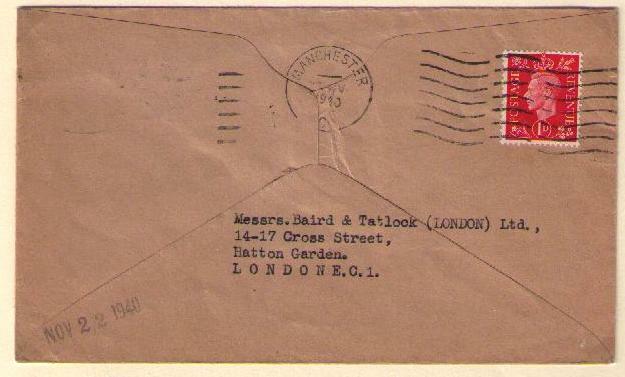 The envelope was first mailed from Manchester to a local address, August 5, 1942. 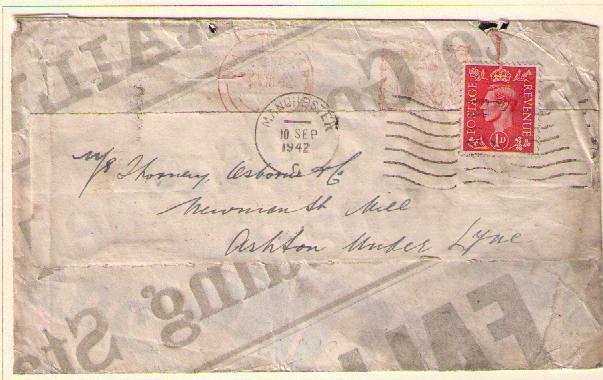 An addressed label was affixed to the envelope to cover the original address and mailed to Ashton under Lyne on September 10, 1942. 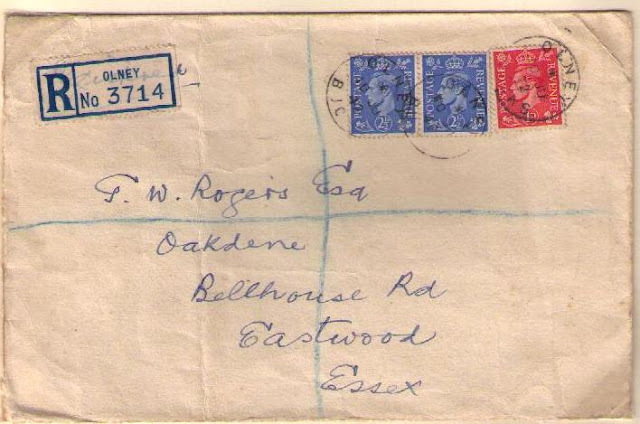 The cover shown below shows use of both sides of the envelope. 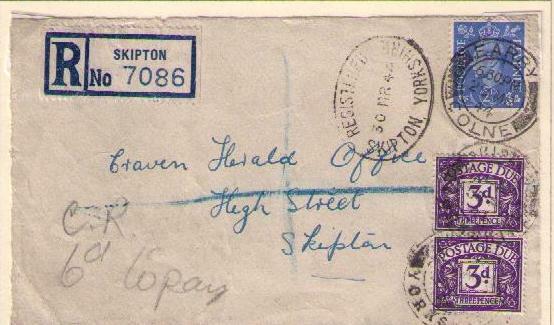 "SEE OTHER SIDE' was handstamped over the address. 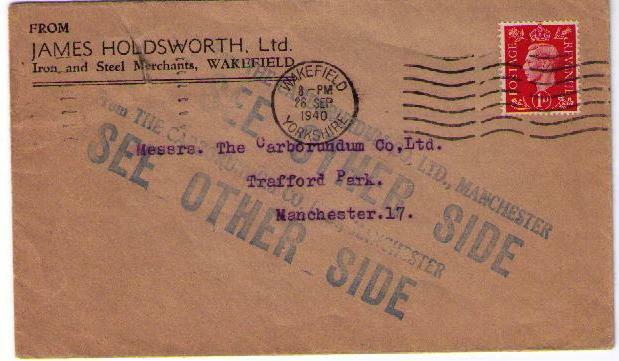 The registration fee (minimum) was 3 d.
Royal Ordnance Factory (ROF) Chorley was a goverment-owned munitians filling factory. 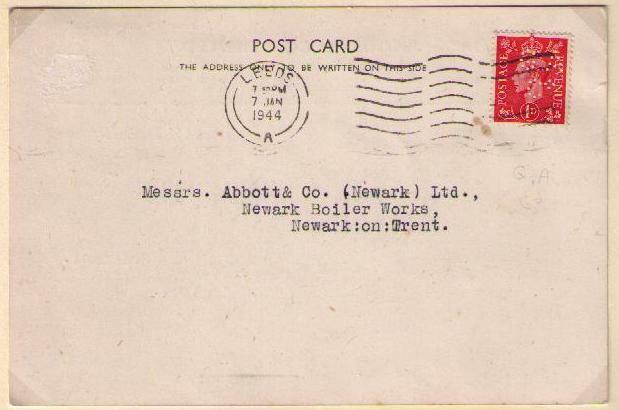 The factory employed over 1,000 production workers by the outbreak of the Second World War. 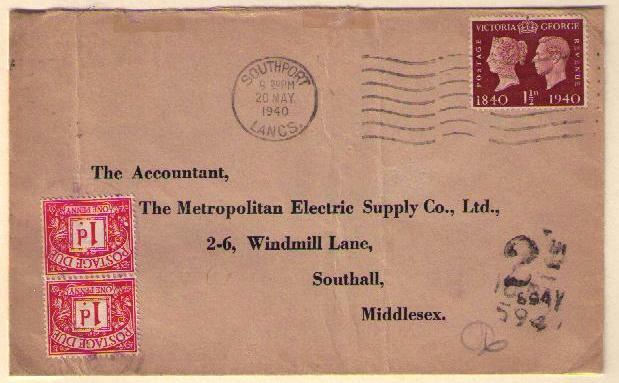 By June 1940, the numbers employed there had risen to nearly 15,000. 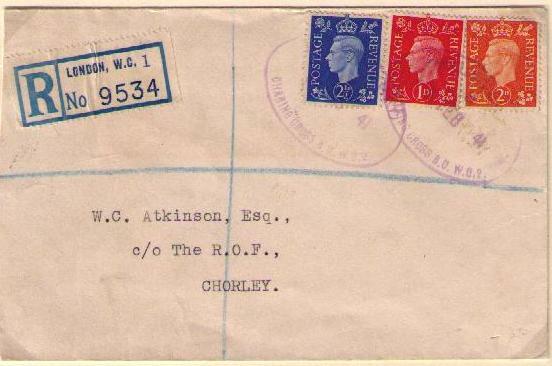 At its war-time peak, ROF Chorley had over 28,000 employees. 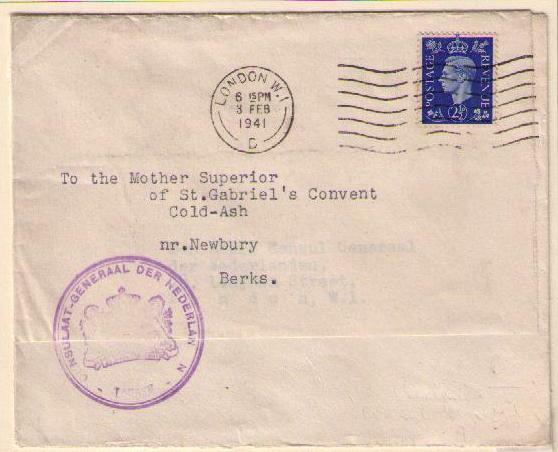 Instructional label advising that the packed was compulsorily registered because it contained coins. 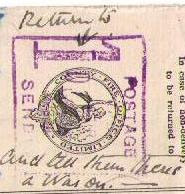 Posted Out of Course handstamp , i.e. 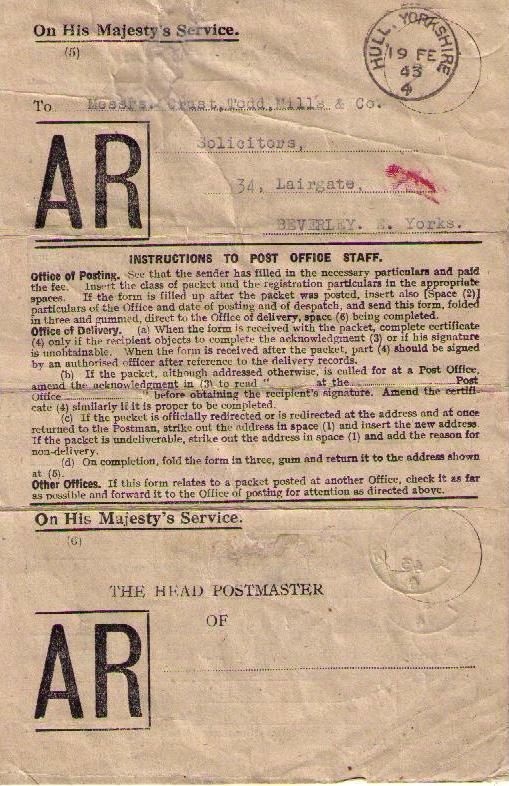 posted in letter box rather than at the Post Office. 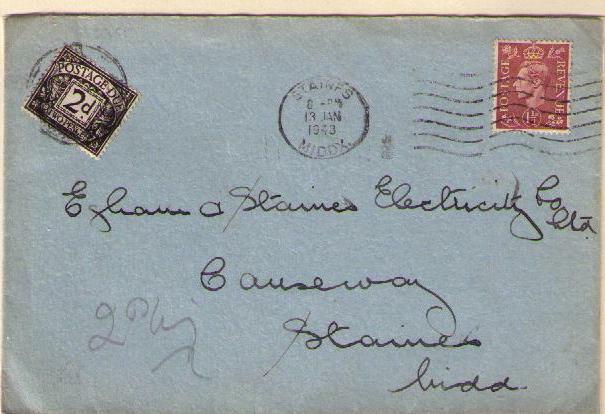 Registration label affixed by the Edinburgh R.L.O. Posted Out of Course , i.e. 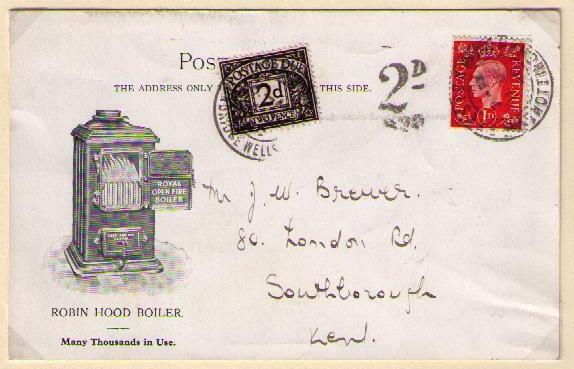 posted in letter box rather than at the Post Office. 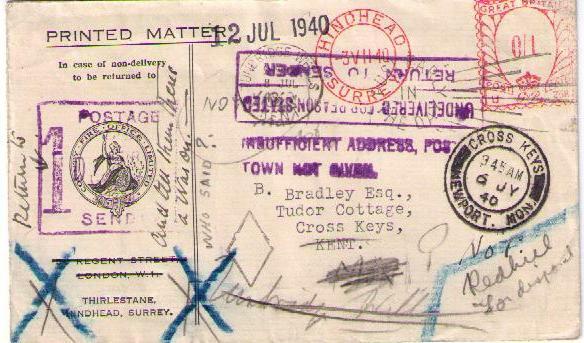 Registration label affixed by the Merstham post office. Amount due was 3d. since the amount prepaid was 5 1/2d. 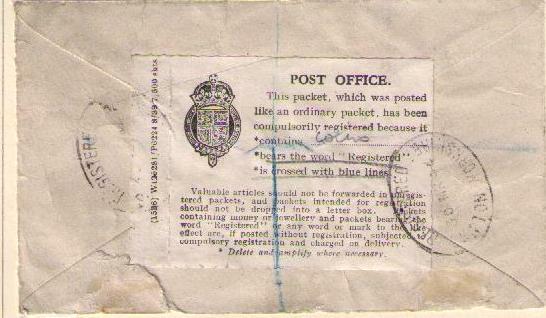 The sender of any registered postal packet could arrange at the office of posting, either at the time of posting or subsequently, for an advice of its delivery to be sent to the sender. 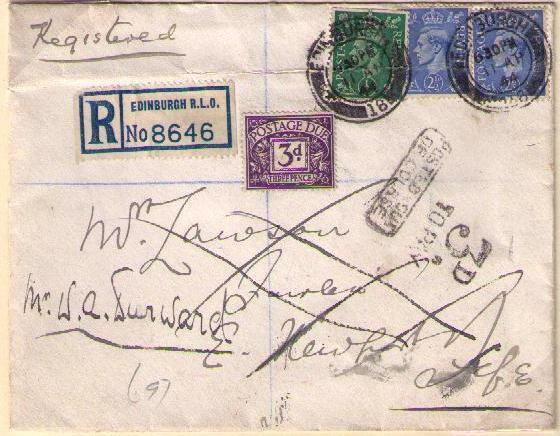 The fee was 3d., which was payable by means of stamps affixed by the sender to a form provided for the purpose. 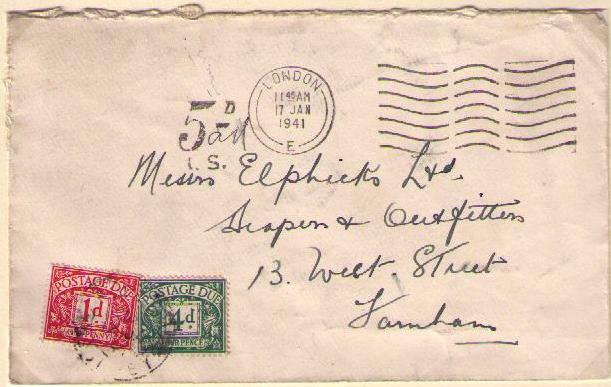 The express delivery fee was 6d.